A premium fishing rods for premium results…of course getting in the hours angling definitely helps! Just how expensive can a truly special fishing rod get? Does that extra money translate into better quality? What exactly are the differences between a $50 fishing rod and a $500 fishing rod? These are just a few of many questions we’ve received from readers when it comes to finding the perfect fishing pole and hey let’s be honest: we often wondered the same things ourselves. At those prices these are fair questions to ask! The truth is that while price won’t always correspond to better performance, manufacturing, or design – often times there is a fairly strong correlation. While some companies try to put together a crap rod and jack up the price, at a certain point word will get out and they’ll be done for. When you can afford the best materials, the best workers, and the best designers, you can generally expect an expensive new fishing rod to often be premium in every way. So read on to take a look at some of the premium fishing rods currently available on Amazon. G.Loomis Saltwater IMX Surf Series Top rated premium saltwater fishing rod. 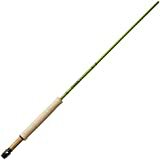 Hardy Zenith #4 4-Piece Fly Fishing Rod Truly exquisite fly fishing rod that stands above the rest. Sage Pulse Series Double Handed Fly Rod Truly elite two handed fly rod. Daiwa Basiair Z45 Premium Carp Rods Arguably the finest freshwater fishing rod (and the best carp rod for sure) ever. 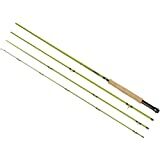 Fenwick HMX-S662M-F Fishing Rods Freshwater fishing rod in its highest form. 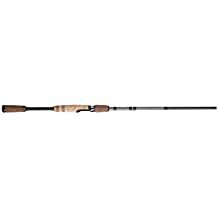 Sage Fly Fishing X Series Two Handed Rod Stunningly good two handed fly fishing rod. Leland Rod Co. New Zealand Trout Fly Fishing Outfit The best New Zealand has to offer anglers! Goran Andersson Signature Series II Fly Fishing Rod Truly the best of the Signature Series. 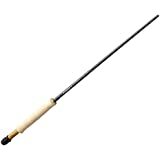 Sage Fly Fishing MOD Series Fly Rod Incredible medium action fly fishing rod. Red Truck Diesel Small Stream Trout Fly Fishing Combo Outstanding combo to bridge gap from very good to elite - most budget friendly option. The IMX SURF Series of premium fishing rods is the gem of what the G. Loomis brand has to offer when it comes to truly high-quality saltwater fishing poles. These spinning rods are crafted to specialize in long-range casting. This is essential if you are going to successfully get your lure past the surf to the fish out past them. Ranging from 8 feet to 11 feet in length, these premium rods have a wide array of variations depending on what you are looking for in your premium on-shore saltwater fishing rod. Crafted to work easily with fishing line anywhere from 12-pound test to 40-pound test line, and with lures from .5 to 6 ounces, there’s a lot to love about what these rods have to offer. They are built to be incredibly durable, as well as feature handles with a trademarked sure-grip technology for better feel and a reel seat that allows for the smallest of adjustments based on arm length. In other words, this premium fishing rod is designed to be customized to your personal shore casting needs. The trademarked Fuji K-frame Alconite guidance system makes it nearly imposssible for the line to catch or wrap in the frame with a major tangle. The frames lean ever so slightly forward to help make sure that fishing line flows through not only freely, but very efficiently and effectively, as well. That means further casting without worry about tangles. That’s just what you want when working the coast with a premium fishing rod. 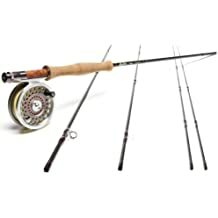 For the fly fishing angler who is looking for a truly special fly fishing rod, the Hardy Zenith #4 is a 4-piece fly fishing rod that is 8 feet in length and really brings an incredible strength and feel to the fly fishing angler’s hands. This is a premium fishing rod that might not be for everyone, but if you love the thrill of dropping a fly down to a hungry trout then this will be for you. The Hardy Zenith #4 is a full 30% lighter than the average fly rod of the same size, and yet is built from a special proprietary material blend “Hardy Sintrix” that makes it 60% stronger as well. This leads to an incredible amount of strength and control that will really up your fishing game whether you love fly fishing for trout or smallmouth bass or something else entirely. Recoil titanium guides further highlight the extremely high quality of these fishing rods, as well as the AAAA rated cork handle (reverse half well). This rod even comes with a strong protective travel case made from machined aluminum for easy and safe transportation. 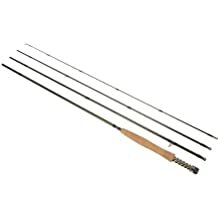 The Hardy Zenith fly fishing rod has the SINTRIX matrix design to create truly high strength and when you add that in with light weight, this is a true winner and one of the cases where one of the best expensive fishing rods is also definitely one of the best premium fishing rods out there. Long casts, tight loops, little effort required for serious control and power, and plenty of fighting power to enjoy. This rod is worth every penny of the money. Special Note: This model is popular enough with anglers that it tends to sell out, but don’t be afraid to order and get on the waiting list! They tend to fulfill these orders relatively quickly and the quality of this premium fly rod makes the short wait well worth it. Sage is a brand that avid anglers will recognize. Long one of the major names in premium fly fishing gear, Sage is known for manufacturing truly high end fly fishing rods that are consistently held up as an example of some of the absolute best that money can buy. If you’re looking for a premium fly rod, you are never going to be let down by a Sage. The Pulse series is a fast action rod that offers a beautiful aesthetic with olive thread wraps complimented with black trim wraps to compliment. Matching this aesthetic are hard chrome snake guides while the reel seat is made up of an anodized aluminum that is a sheer glossy black. This combines outstanding design and construction along with beautiful aesthetics. These fly fishing rods not only work for conventional trout, sunfish, or grayling, but have been tested out with smallmouth bass, black bass, and even big salmon. These rods hold up to pressure and deliver a wonderful and pleasurable fishing experience that any fly fishing enthusiast will absolutely love. If you aren’t completely sold on the Sage Pulse series, take a look at the also wildly popular Sage One series of premium fly fishing rods. Well reviewed, well made, this is a slightly more budget-friendly option that still delivers high premium quality. When the Daiwa Basiair X45 came out it was (at the time) widely considered the world’s most expensive mass manufactured carp fishing rod and many anglers wondered if any fishing rod could possibly be worth the money they were asking for it. Quickly review articles from reputable sports fishing and coarse fishing magazines came back and to wide scale surprise (often even of the reviewers themselves) the verdict came back crystal clear: the fishing pole was worth north of 800 British Pounds (at the time around $1100 U.S. before taxes) because it wasn’t only next level but it was a new level that most of these long seasoned anglers didn’t even know could exist. That model was the basis for this one: the Daiwa Basiair Z45, with Daiwa somehow improving on the original and proving once again while they are widely regarded as the best manufacturer of carp rods in the world. And if the rod can handle a giant carp, it can handle most big time freshwater fish, as well! This is a two section rod that is 13 feet in length, with a verified test curve of 3.5 lbs, 7 guides, and yet weighs a mere 13.47 ounces. Unbelievably light, incredibly strong & durable, and bringing touch and the thrill of fighting a giant fish to a whole new level, there is nothing about this premium freshwater fishing rod that we don’t love! Daiwa has long been a premium name when it comes to top of the line fishing rods, and the Basiair is the best of the best of what they have to offer, combining the knowledge and special skills of two groups: Japanese engineers and professional European carp anglers. This was the result of two years of design and re-design, with heavy technical standards using engineered plans. This is an incredible fishing rod that uses carbon fiber materials for fast action, flexibility, and durability. DAIWA has bragged that this is the best fishing rod they have ever made. These can be very hard to find on the open market, and this 2-pack is perfect for the truly dedicated and obsessed anglers in the family! This good looking black rod is 6.6 feet in length, medium-fast action, and uses quality construction that involves actually overlapping different layers of carbon fiber in order to bring about the perfect combination of strength, durability, feel, and action. Aside from this exceptional cross-scrim graphite construction, the SS304 guide system is plated with hard chromium so even the toughest of braided lines will work smooth as butter. Add in some lightweight guides, titanium inserts, and the proper stainless steel frames and what you have here is a truly elite fishing rod for anglers who want the absolute best. The HMX rods have a reputation for being strong and steady while offering an incredible sensitivity to feel. This allows better hook sets and that means more trophy fish. There’s a reason many anglers stay with Fenwick after their first fishing experience with this brand. This reiteration of the HMX brand lives up to the old hype and more. This is a stunning two piece rod that gets the job done and there’s a reason anglers going after trophy sized bass, walleye, muskie, and northern pike have all endorsed this rod: because it’s worth every penny and gets the job done! The new two-handed fly fishing rods from Sage Fly have definitely caught the attention of avid fly fishing enthusiasts who appreciate truly quality craftsmanship. These two-handed poles are part of Sage Fly’s X Series and provide an outstanding number of benefits to anglers looking for that little bit extra during the casting stroke. Featuring a design that focuses on trademarked KonneticHD technology which balances the rod for a more efficient and smooth cast – and fly fishing enthusiasts know the importance of getting that perfect smooth casting stroke right off the bat. A popular steelhead and salmon rod, the entire construction here is designed for better optimized use. Line speed is optimized with a well designed tip stop and the rod’s shaft is designed to strengthen recovery. In other words, it focuses on every part of the cast and gets you the best results for each flick of the wrist. Crafted by hand on Bainbridge Island, USA, these premium high-quality fishing rods offer the type of incredible feel and reaction that only comes from items made by hand by caring professionals. You will see and feel that workmanship the very first time you take a cast in your favorite creek. This top of the line fly fishing rod looks amazing, reacts incredibly, and offers you the absolute best a fly rod can bring to the table. Going beyond just the rod, the Leland Rod Co. of New Zealand really is the ultimate outdoorsman’s combination. For anglers who are obsessed with fly fishing and want only the best, it is hard to argue against what Leland has to offe with their trout fly fishing outfit here. 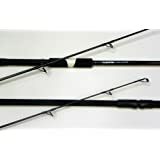 This rod is exceptionally well balanced and allows for graceful and easy casts that are smooth as silk and allow experienced fly fishermen to drop the fly right in that perfect spot to entice trout to strike. Leland uses the absolute best in materials and components to make sure each section is outstanding and the pieces together still become far greater than the sum of the parts. 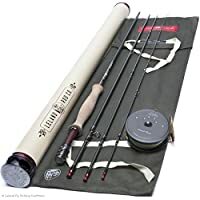 This combination also wins major support since it includes a leather fly reel pouch, padded travel case, extra rod tip, and even a protective fly rod tube. That’s a lot of support for an elite fishing rod, and takes care of a lot of concerns any angler willing to spend good money on a premium fishing pole. Many fly anglers swear by this collection as being one of the most balanced trout fly fishing outfit that you will ever use. New Zealand anglers absolutely love this rod, and the extra rod tip is always great in case an additional one is needed after a fractured tip. All of this together is a touch over 6.4 lbs in weight when shipped, and is an outstanding package deal for avid fly fishing anglers who spend plenty of time out on the water. This is thoroughly New Zealand approved! Goran Andersson’s second signature series of high quality fly fishing rods goes to show why sometimes shopping for the most expensive fishing rods is what you have to do to get results that are above and beyond any fellow anglers that you are competing with. They spent a lot of time developing this stunningly good fly fishing rod, and that was time well spent! 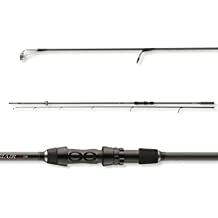 This rod displays a deep flexibility for plenty of action, and that also means a fast action taper. This is the most efficient fly rod action put out by Goran Andersson and it delivers in a big way. This is a 4-piece rod, which breaks down and fits in a protective case for easy and safe travel – no worries about broken tips here! The design is an example of master craftsmanship dedicated in a practical way that understands the specific needs of the fly fishing enthusiast. This is a rod that delivers fun action and avoids the loss of fun that sometimes comes with a 5-weight that takes the fun out of the stream, but this exceptional fly rod with a 2-weight can add a ton of action to make even small trout feel like big salmon and bring back plenty of fun to fly fishing. A handle made from high-grade cork and well-designed triangular reel seat means the rod feels comfortable on the hands while the reel stays in place and your control over fly casting is at its peak. A great addition to any serious fly angler’s collection! Available in 5 sizes, this moderate action fly fishing rod from the renowned Sage brand is the highlight of the MOD series when it comes to truly exceptional high quality fly fishing rods. To end up on this list of the most expensive fishing rods (and obviously we only review elite products so we don’t peddle/review expensive crap – so this needs to be elite to make the list) with some of the other names in this article, you need to be able to not only hold your own but thrive. Check, check, and check. This Sage fly fishing MOD rod is medium action and aesthetically looks as good as the rod handles with yellow and green thread wraps that intertwine with black trim. The snake guides are hard chromed while the design of this rod includes exceptional anodized aluminum for the reel seat while a Zebra wood insert means solid construction. This fly fishing rod is designed and optimized for the ideal distances and individual scenarios that your trout and steelhead fly angler is going to be the most likely to run into. Experienced anglers will have no problems landing pin point accurate casts and taking full control of your casting from whatever angle or direction you need. If you’re looking for a truly elite fly fishing rod then you definitely want to take a look at what the Sage Fly MOD series of fly fishing poles have to offer. These are made and manufactured in the United States. There have been plenty of outstanding fly fishing rods to appear on this list, and for good reason. The willingness to spend money on expensive fly fishing rods that are worth it, and the huge passion that these anglers have for the sport, means plenty of brands producing stunningly good high-quality fishing rods. The fishing combo here includes not only the exceptional rod but also an equally well designed and manufactured reel. Add in some line, a leader, flies, and tools, and this is a small stream combo that not only provides the really high quality elite rod but also all the additional tools and components you need in order start fly fishing right off the bat. Add in a lifetime warranty because of their confidence in the construction and you can quickly see why this is yet another truly elite fly fishing rod that is popular with many anglers. This fully rigged combo is much more budget friendly than most of the others on this list, and is still a really remarkable fly fishing combo that is excellent for trout, grayling, and sunfish. This design is rigged for anglers who prefer to reel in with their right hand, but it can be used with either. 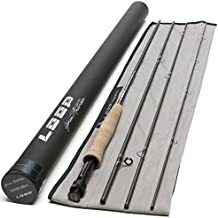 Outstanding kit for someone wanting to start that movement to the next level of equipment, but can’t shell out one or two thousand for a rod. One of the questions that will frequently come up once you start talking about $1,000 fishing rods or $2,000 fishing rods is whether or not it is worth it. While this can obviously be seen as the type of question that can only be answered based on individual preferences, but the general answer is simple: Yes. There is no question that these often carefully crafted, designed, and hand made fishing rods are going to be clearly superior to the average fishing rods most anglers settle for, or the cheap ones that are available to anyone. An expensive rod is going to be better designed, made from better materials, and function better. Almost all of us have used a cheap fishing rod at one point or another, and we all know the issues that come up from using inferior equipment. That doesn’t mean they can’t last, but there will be a need for replacement fishing gear in the future. A truly top notch fishing rod like the ones mentioned in this article will deliver an entirely new level of experience. So yes, if you have the budget, they are very much worth it! Q: Are expensive fishing rods worth it? A: Generally speaking, yes, they are. Better materials often means rods are lighter and yet stronger, finding a combination between strength and action that true anglers will notice and enjoy. If you are a regular angler, then expensive fishing poles pay off in a really big way as one positive experience after another begins stacking up. If you can afford a fantastic premium fishing rod then you absolutely should take advantage – especially if you spend as much time as possible out fishing! Q: Is the most expensive fishing rod on this list? A: No. Aside from the fact that price can vary from year to year, specialty and customized fishing rods are a major market and there are manufacturers who make individual rods that are thousands of dollars. Sometimes because of quality but also because of aesthetic design and brand fame. Q: What is the most expensive carp fishing rod? A: As of a couple years ago that would be the Daiwa’s new Basia AGS fishing rod, which is upwards of 800 British Pounds on average. However that was the X45 model that received rave reviews and then was even further improved into the Z45 – which we do review on this list (pair of two available). The most expensive carp rod we feel comfortable reviewing is the Basia Air Z45 which is reviewed higher up on the article. A good write up on the original Basia AGS can be found HERE. Q: What is the most expensive saltwater fishing rod? A: Yeah, good luck keeping up on that one. That being said, we’re happy with our pick for the premium shore casting tide rod up at the top of the list. Might not be the type of saltwater fishing you do, but it is a true premium rod that has proven it is worth the price. Q: Is there a difference between expensive fishing rods and very expensive fishing rods? A: This might depend a bit on what your definition of expensive is, as well as what brands you are comparing. There is a certain point where it doesn’t necessarily make a difference anymore, the law of diminishing returns and all, but this really is one of those questions that needs to be answered on a case by case comparison basis. Q: Why are there no premium ice fishing rods here? A: Ice fishing is a much different type of animal from fly fishing, saltwater fishing, or conventional season freshwater fishing. Ice fishing is much less about having a really expensive high end rod and a lot more about the right auger, the right sturdy line, and the right gear to enjoy a day out on the ice. Q: Why the heavy emphasis on premium fly fishing rods in this article? A: In this case it is because fly fishers tend to be very passionate about their craft and are often very open to buying high ticket items. The required skill and finesse means every little advantage can make all the difference and because of that combination of form and passion, there are simply multiple manufacturers who create truly top of the line fly fishing rods. So they are a bit over-represented here because of that. Q: What are some of the true high quality fishing rod brands? A: This is going to vary depending on what exactly you’re looking for, and the type of fishing that you do, but some of the really big names synonymous with truly elite level fishing rods include Sage, Fenwick, G.Loomis, Daiwa, and Goran Andersson, among others. If these look familiar then congratulations – you’ve been paying attention! There’s a reason rods made by these brands have made our list because they really are truly top of the mountain. Q: Which one of these fishing rods is the best? A: Impossible to answer. Are you saltwater fishing? Casting from shore? Fly fishing? Freshwater fishing? All of these change which rod is more useful for you – and all of the fishing rods in this article are truly elite premium rods that are going to be among the best you find for any type of fishing. Even picky anglers should be happy with almost any one of these choices. While some anglers don’t have the budget to go with a true top of the line fishing rod, these are the type of purchases that you want to save for if you are an obsessed outdoor enthusiast. The additional control, the amazing ability to feel even the most tentative tap from a hungry fish, the extra distance and precision during casting – these are just a few of the incredible experiences that come from having a truly elite fishing rod.